Snowfalls In Himachal: In Shimla and other popular tourist resorts like Manali and Dalhousie, internal roads were too slippery for traffic as these were laden with snow. Snowfalls In Himachal: Such halts have resulted in long traffic gridlocks. Weekend tourist rush to enjoy snowy landscapes in Himachal Pradesh, slippery roads and lack of traffic management in picturesque resorts of Kufri, Fagu and Charabra have brought these picnic destinations to a halt - quite literally. Such halts have resulted in long traffic gridlocks adding to the problem of the commuters, mainly locals. "It took two hours for me to cover just 13 km between Kufri and Shimla on Saturday due to traffic mismanagement and slippery road conditions," Himkiran Manta, a resident of Shimla, told news agency IANS. He said tourists were responsible for most of the traffic jams. "Since the tourists are not adaptive to driving vehicles on snow-laden roads, they often create unnecessary traffic jams by getting their vehicles struck," he said. Mr Manta, along with his family, was held up in Rohru, some 120 km from Shimla, for the past five days after closure of road links due to snowfall. He said the roads were partially reopened but were still treacherous owing to slippery conditions and early morning frost. In Shimla and other popular tourist resorts like Manali and Dalhousie, internal roads were too slippery for traffic as these were laden with snow. Even walking in the streets was risky. Areas near Shimla like Kufri and Narkanda and popular tourist resorts of Manali and Dalhousie are covered in a thick blanket of snow. Snow could be seen in certain areas of Shimla like the Mall Road, the Ridge, the US Club and Jakhu hills. Due to slippery condition of roads and pathways in Shimla, many pedestrians, most of them tourists, were getting injuries. Tourists have been facing much difficulty in Shimla and Manali as most of the parking lots are slippery and covered with good quantity of snow. 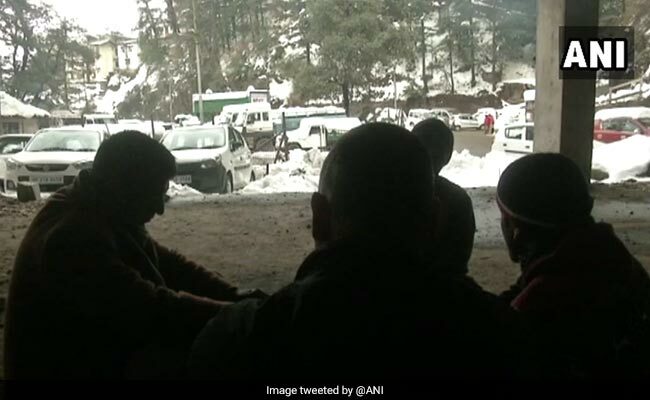 "I had to give Rs 1,000 for hiring potters to get my car out of the snow," Rahul Ramachandran, a tourist in Shimla from New Delhi, said. Shimla Deputy Commissioner Amit Kashyap has asked tourists to avoid travelling in their vehicles beyond Shimla as the road is slippery after the snowfall. "We are advising the motorists, especially the tourists, to park their vehicles at Dhalli and use public transport to reach Kufri and its nearby destinations," he told IANS. Officials said roads in the higher reaches of Kinnaur, Shimla, Chamba, Mandi, Kullu and Sirmaur districts were severely hit by heavy snowfall and work was on to reopen these. An avalanche alert has been declared in higher reaches, mainly in Kinnaur, upper areas in Manali and Pangi subdivision of Chamba which experienced heavy snowfall. The Met Office has forecast more snowfall across the state on January 30.